In Part 1 of our our Guide to Trekking to Everest Base Camp we looked at how to prepare for the trek before you go, in Part 2 we tell you all about the route, accommodation, food and drink, how to stay healthy and how to trek responsibly. In fact, everything you need to know to successfully complete one of the world's most iconic treks. Most treks into the Khumbu start at Lukla – the busy mountain village located at 2,860m. The sloping runway at Lukla, perched on the mountainside, provides an unforgettable ‘white-knuckle ride’ when you come in for landing. Grab a seat on the left hand side of the plane for the best views of the Himalaya on the short flight from Kathmandu. At Lukla you will be met by your Sherpa guide and trek crew who will whisk your luggage off the plane and load it onto waiting dzos (a yak/cow cross breed). After a warm welcome, and your first of many cups of tea - known locally as chai - you’ll soon be ready to step out on the trail to Everest. From your very first step the scenery is captivating and for the next couple of days you’ll follow the wonderfully picturesque Dudh Kosi river valley up to Namche Bazaar – the main Sherpa town in the Everest region (also known as the Solo Khumbu or just Khumbu). This is a great place to rest, acclimatise and buy any kit you forgot to pack. You’ll also enjoy your very first thrilling views of Everest as you make the arduous climb up to Namche. From Namche, it’s a two or three day trek to your next major destination on the trail – Thyangboche. The more direct route treks via Syangboche whilst the longer route goes north west along the Nangpo Drangpo Valley to reach the small village of Thame - once home to Tenzing Norgay the most famous Sherpa of them all. This trail has been used for hundreds of years as a trading route between Tibet and the Khumbu which means you’ll be sharing the path with yak trains and Tibetan traders. 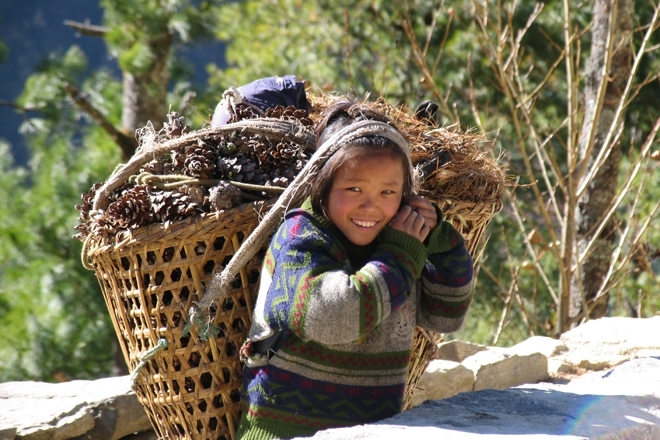 This alternative route is not on every company's itinerary, but adding an extra day to Thame will not only help with your acclimatisation but also take you to one of the most picturesque villages you’ll visit on the trek - surrounded by high peaks and with a 600 year old monastery, or gompa, to visit. From Thame you return to the main trail and continue on to Thyangboche via several pretty villages, rhododendron forests and ever impressive mountain scenery. Finally, you ascend along a steep path to reach Thyangboche, the main Buddhist monastery of the Khumbu, situated on a high saddle. If the weather’s clear, the views to Everest and Ama Dablam from here are simply stunning. Once a year, the Monastery comes alive with the vibrant music and masked dances of the Mani Rimdu Festival. After Thyangboche you will notice a change in the scenery. As the air gets thinner the landscape and vegetation becomes increasingly stark and dramatic. Seriously high snow-capped mountains now surround you on every side with Ama Dablam dominating the skyline. Your progress will be very slow as you adjust to the high altitude and your itinerary will include plenty of rest as well as days when you can climb high and sleep low which will really help you to acclimatise properly. Eventually you will reach the tiny village of Lobuche from where you’ll make the final push to Base Camp itself. The trek from Lobuche is a long and strenuous one over rocky terrain but, after several hours of hard trekking, you will step foot on one of the most iconic places in the world. During the spring climbing season you may see expedition teams camped out as they prepare for their attempt at the summit. From Base Camp you can’t actually see the summit of Everest, but you will have fantastic views of the treacherous Khumbu ice-fall. For close-up views of the summit itself, you need to trek from Lobuche to the small peak called Kala Pattar which sits directly across from Everest. From here there are truly spectacular, panoramic views of Everest and other Himalayan giants such as Nuptse, Lhotse and Pumori. The three day return trek to Lukla seems like a walk in the park compared to your strenuous trek out. Once back, you’ll no doubt enjoy a celebratory beer and meal with your fellow trekkers and toast your achievement in completing the most famous trek in the world. Read an entertaining account here of one trekker’s experience on the trail to Everest Base Camp. Tea houses are the traditional type of accommodation on the trail. These simple, inexpensive lodges provide a welcome refuge with hearty food, copious amounts of tea and a warm communal area for eating and relaxing. Bedrooms are basic but adequate as are the toilet facilities (normally a drop toilet or ceramic ‘squat’ style). There is no running water in the rooms at the tea houses so water is heated centrally and provided in bowls for washing each day. Showers, if available, are often ingenious contraptions powered by solar energy. Built and run by the local Sherpa people, tea houses provide an invaluable source of income for this remote region. We use tea house accommodation on our classic Everest Base Camp Trek. More luxurious lodges are a recent addition to the Base Camp trail. They generally have comfortable, en suite bedrooms, hot running water and more ‘refined’ dining. Our Everest Base Camp in Style trek, uses luxury lodges for most of the trail to Everest. The staple diet of much of Nepal is daal bhat - a meal of rice topped with soupy lentils sometimes served with spiced vegetables. Energy rich, it’s the perfect meal to eat whilst trekking to give you much needed fuel. Similarly, potatoes are an important part of the Sherpa diet and widely grown in the Khumbu. In addition to daal bhat, the tea houses and lodges serve a surprising variety of food – catering as much as possible to the western palate. However, we would advise that you keep your choices fairly simple and stick to foodstuffs that you normally eat at home. It’s also a good idea to avoid dairy products, raw vegetables, salad and uncooked fruit. This will help minimise tummy upsets as will being scrupulous about personal hygiene before you eat. Black tea is the ubiquitous drink for trekkers. Served at every opportunity in huge flasks, it’s a comforting and important part of your trekking diet. You’ll see that the Sherpas take their chai pre-brewed together with milk and copious amounts of sugar. If you’re not a tea drinker then instant coffee and hot chocolate is also available. It’s really important to drink as much as possible on trek and your trek leader will ensure that all the drinking water you are provided in the tea houses has been properly boiled and purified. We don’t recommend buying bottled water as the plastic bottles are a serious environmental problem for the region. Alcohol (normally bottles of beer) is also available at the tea houses but we strongly recommend avoiding drinking any alcohol till after your trek finishes as it doesn't help with acclimatisation. Altitude or Mountain sickness is one of the biggest fears of first time trekkers to Everest but it really doesn’t need to be. Simple precautions can help mitigate the effects of being at altitude and ensure that most people will experience minimum symptoms such as mild headaches, insomnia, some breathlessness and occasionally nausea. Walking slowly, taking regular rests, eating and drinking lots to stay well hydrated and ascending gradually are the keys to staying healthy. If you are suffering from any symptoms at all tell your guide immediately - he will assess your condition and advise as to the best course of action based on many years of experience. Your trekking itinerary includes rest days as well as the opportunity to ‘climb high, sleep low’ as you reach higher altitudes which is really important for good acclimatisation. For further information download a copy of the highly informative Travel at High Altitude from Medex: http://medex.org.uk/medex_book/english_version.php. Don’t leave any litter behind – including tissues or toilet paper. Avoid buying bottled water. Although it is widely available at the tea houses, the empty plastic bottles cause a real problem. All hot water has to be heated at the tea houses over a fire. This can often use a lot of firewood or other fuel which is unsustainable. Therefore, think carefully about your use of hot water and how you can help conserve fuel. Stick to the paths to avoid damaging and eroding the trail and don’t take away any natural materials as souvenirs. Public displays of affection are frowned upon and are disrespectful of local customs. If you want to take a photo of the local – ask them politely first and get their permission. Dress modestly – locals may find shorts, skimpy tops or tight fitting lycra offensive. Respect religious practices and beliefs. For example, pass to the left of mani walls and chortens, turn prayer wheels clockwise, take off your shoes before entering a monastery or gompa and leave a donation behind. You should only pass food with your right hand (the left hand is considered unclean) and don’t touch the head or shoulders of a local person as it is considered the most sacred part of the body. Don’t flaunt your wealth, be discreet with cash and don’t give money or sweets to children. Not only does this encourage begging, but the sweets can cause tooth decay. Much better to spend some time playing or interacting with the local people or taking/showing photos. Try and learn a little of the local language and sample some of the Nepali food and drink – it’s really appreciated. Always be friendly and considerate to your trek guide and crew. In fact, always be polite, friendly and considerate to any Nepali you meet. ‘Take nothing but photos, leave nothing but footprints, kill nothing but time.’ If you make these wise words from the Sierra Club your mantra, you won’t go far wrong. So, you’ve successfully trekked to Base Camp and fallen in love with the people and landscapes of the Everest region, so where next? If you have more time, then a trek beyond Base Camp to the stunning Gokyo lakes should be top of your wish list. Alternatively, you can follow our Three High Passes to Everest route and trek in some of the lesser-visited valleys such as the Renjo La and Chukhung. For the more adventurous, trekking peaks such as Island Peak or Mera Peak offer a thrilling challenge. 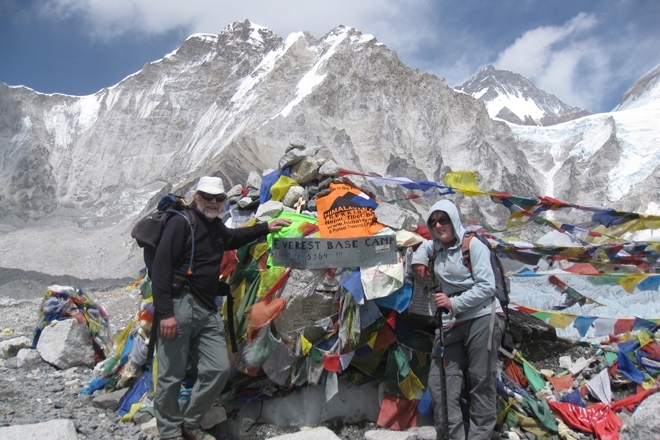 You can see all our Everest trekking holidays here. So there you have it, everything you need to know about trekking to Everest Base Camp. Now all you need to do is book your trip and complete the greatest trek in the world. You won’t be sorry you did.